Cheers! Today I'm sharing with you some of my reader favorite drink recipes. These drink recipes have received TOP PIN honors on Pinterest and Top Clicks on my blog. I hope you find some new ideas! 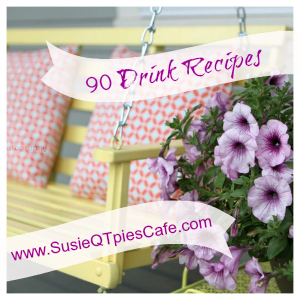 Besides these recipes, I have over 90 more to share with you on my Drink Recipes Pinterest Board. Stop over and find something new! 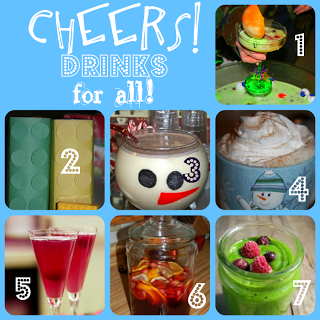 Here are the top clicked and top pin drink recipes on my blog and a few others. 2-LEGO juice boxes-Perfect for your favorite LEGO fan! 3-Egg Nog-serve it in a snowman head! SNOW much fun! 4-Hot Vanilla Night Cap-Just takes one and you'll be to sleep in no time! My other featured board is my Top 25 Weekly Blog Parties Board on Pinterest. Find out where to find link parties! If you have a weekly party you can be added to the board. Leave your blog party link in the comments. Hey there! Thanks so much for stopping by and linking up your recipes! Stop by again next week and link up another awesome project!